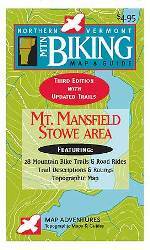 Northern Vermont Mountain Biking Map & Guide, by Map Adventures, 1998. Colorful topographic map (paper, 20-meter contours) showing 32 mountain bike trails and road rides in the Mt. Mansfield-Stowe area. Trail and route descriptions on reverse. Folded to 3 �� x 6 ��.